21 February 2018 - A Bahraini criminal court sentenced prominent Human Rights defender, Nabeel Rajab, to five years imprisonment relying on posts on his Twitter account in 2015 as well as retweets about alleged torture in Bahrain’s Jaw prison, and the killing of civilians in the Yemen conflict by the Saudi Arabia-led coalition. 25 January 2018 - Several elements are strongly suggesting that the safety of Nabeel Rajab is endangered, as he is in deep need of medical assistance and the conditions are not gathered for the medical care offered by the Ministry of Interior Hospital to be considered adequate, trusted and reliable. 15 January 2018 - The Bahraini Court of Cassation in a final decision upheld the two-year sentence of Nabeel Rajab for the case related to his participation in televised interviews. The Twitter case is postponed for the 20th time, the final hearing rescheduled to the 21st of February. 7 December 2017 - While the hearing for the Twitter case was scheduled on 31st of December, the Bahraini authorities changed the date to the 5 December, giving the defense very short time to adapt. Finally, it was adjourned and supposedly taking place on the 7 December, to finally be postponed to the 15 January. 22 November 2017 - Nabeel Rajab's sentence to two years in prison for speaking to journalists was upheld on 22 November 2017 by a Bahraini appeal court at the conclusion of a long-running, unfair trial. 19 November 2017 - The hearing on the case relative to the tweets is postponed to the 31 December. AS the employee appointed by the Ministry of Interior was unable to give any evidence regarding the IP related to the tweets, the Court pretended the need for additional research and requested a technical report about the Twitter account from which the tweets were posted. 8 November 2017 - Nabeel Rajab's final hearing for the appeal in the case of the televised interviews is postponed to the 22 November. The Bahraini court refused to hear defense's arguments and rejected his petition for bail. 26 October 2017 - Alarming reports assert that Nabeel Rajab has been subjected to degrading treatment following his arbitrary transfer from the Ministry of Interior Hospital in al-Qalaa to the Jaw Prison, including humiliating search and forced shaving of his hair. 25 October 2017 - Nabeel Rajab's appeal in the case of the televised interviews is postponed to the 8 November. 27 September 2017 - The hearing in the trial related to the tweets is postponed to the 19 November. 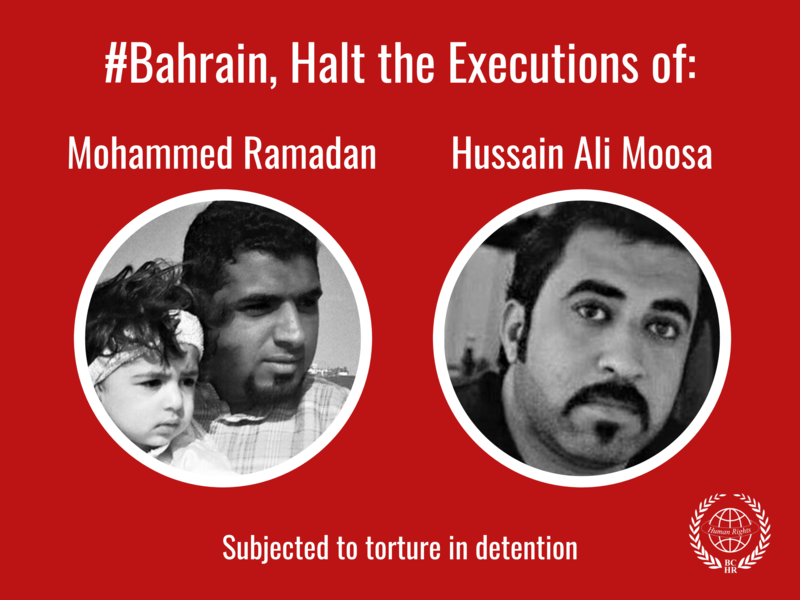 Ths is the 16th times a Bahraini court adjourned a hearing in that case. 8 August 2017 - A Bahraini Court decided to postpone issuing its verdict in the case of Nabeel Rajab. 4 July 2017 - According to updates received from his family, Nabeel Rajab is expected to receive a sentence on Monday 10 July in one of the cases against him. His lawyers received a notification on the ruling a day after after the hearing scheduled for 3 July. Rajab is currently facing a case related to press interviews criticizing Bahrain's human rights record, for which he is facing 3 years in prison, and a second case related to tweets and retweets on allegations of torture in Bahraini prisons and the humanitarian crisis in Yemen, for which he might receive 15 years imprisonment. Based on his family's testimony, the Court did not hear the defense during yesterday's trial. 3 July 2017 - The court hearing on press interviews was held in Rajab's and his lawyers' absence. The lawyers have boycotted the trial since 14 June, when they walked out of the trial because of the court's insistence to hold hearings when Rajab cannot attend the court proceedings. His doctor at the Ministry of Interior hospital has stated that Nabeel cannot be charged. 2 July 2017 - Trial related to press interviews adjourned for 3 July, neither Nabeel Rajab nor his lawyers attended. Rajab is still recovering in hospital. He was allowed to contact his family but not his lawyers. 27 June - Alarmed by Nabeel Rajab's detention mistreatment, the Chair of the Subcommitte on Human Rights, Pier Antonio Panzeri made a statement urging the authorities to respect Rajab's freedom of expression and provide him access to family and lawyers. 21 June 2017 - According to his family Nabeel Rajab faces worsening treatment in hospital, where he has no access to his family and lawyers. Autorities are also making pressures to move him back to detention. 14 June 2017 - The trial related to press interviews is postponed to 2 July for the 11th time, and the second trial on tweets and retweets again postponed for 7 Augustfor the 14th time. 13 June 2017 - Nabeel Rajab has been detained in pretrial detention for one year. Rajab's trial related to TV interviews was postponed for the 10th time to 14 June. 12 June 2017 - Nabeel Rajab's trial related to TV interviews was postponed for the 9th time to 13 June. 30 May 2017 - Nabeel Rajab's trial related to TV interviews was postponed for the 8th time to 12 June. 17 May 2017 - Nabeel Rajab's trial related to tweets was postponed for the 13th time to 14 June. 16 May 2017 - Nabeel Rajab was denied bail and his trial concerning TV interviews with international media was postponed for the 7th time to 30 May. 11 May 2017 - Rajab is recovering from his medical condition and remains in Qaala clinic, which is a division of the Ministry of Interior. According to information received by BCHR, his weakened immune system is slowing down the recovery process. 3 May 2017 - The trial regarding TV interviews was postponed for the 6th time to 16 May. 8 April 2017 - After a brief family visit, Nabeel Rajab has been rushed to hospital in an ambulance. 5 April 2017 - Family members of Nabeel Rajab report that he has undergone surgery for bleeding ulcers. His family was denied right to visit. After surgery he has been sent back to solitary confinement, despite further need of medical care. 7 March 2017 - The trial regarding TV interviews given during 2015 and 2016 was postponed for the 4th time to 16 April, then again a 5th time to 3 May. 21 February 2017 - The trial based on charges related to tweets (on torture in Jau prison and the Saudi-led war in Yemen) has been postponed until 22 February. The hearing today on charges related to televised interviews has been postponed to 7 March, his release on bail was denied. 20 February 2017 - Human Rights Watch published a report on Nabeel Rajab's trial. Read the report in full here. 8 February 2017 - Rajab's trial related to the case of televised interviews has been postponed to 21 February. 23 January 2017 - The Bahraini courts held hearings in two different cases against detained human rights defender Nabeel Rajab. In one case, where Rajab is prosecuted over two charges both in relation to tweets and retweets posted in 2015 about the war in Yemen and also about allegations of torture in Jaw prison after a prison riot in March 2015. The first charge is “insulting a statutory body” (Article 216 of the Bahraini Criminal Code) referring to the Ministry of Interior in relation to tweets he posted denouncing the torture of detainees at Jaw Prison. The second charge is “disseminating false rumours in time of war” (Article 133 of the Bahraini Criminal Code) in relation to tweets he published about the Saudi-Arabia led coalition air strikes in Yemen. The High Criminal Court postponed the trial to 21 February 2017 to hear the testimony of the Public Prosecution’s witness in the case. Rajab faces imprisonment of up to 15 years if convicted. 2 - Television Interviews Case: First Hearing. The court held the first hearing in this case on 23 January 2017, however Rajab was not notified of the session and therefore did not attend nor have any lawyer to attend on his behalf. Rajab is charged with “publishing and broadcasting false news that undermines the prestige of the state” that is related to three televised interviews in 2015 and 2016. Rajab was arrested on 13 June 2016 and continues to be detained on this case. The court postponed the trial to 8 February 2017 to notify Rajab and his lawyer. The Bahrain Center for Human Rights (BCHR) condemns in the strongest terms the ongoing detention and judicial harassment of Nabeel Rajab, its President. We call on the Government of Bahrain to immediately and unconditionally release Nabeel Rajab, drop all charges against him, and lift his travel ban. 05 January 2017 - Over 200 days in detention. The public prosecution extended detention of HRD Nabeel Rajab for another 15 days today. 28 December 2016 - A court today ordered the release on bail of Nabeel Rajab while his trial continues. His next hearing is due on 23 January 2017. While he is banned from traveling. However, public prosecution refused to release him and said that he will continue to be held over other charges. 22 December 2016 - Human Rights Watch published "France and Germany: It's Time to Assert Your Values" by Nabeel Rajab, published in Le Monde (in French) on 21 December. Read the full letter in English here. 21 December 2016 - Bahraini authorities have interrogated imprisoned human rights defender Nabeel Rajab on allegations stemming from a letter he recently published in the French newspaper Le Monde. The Cybercrime Unit has accused Rajab of using the article to “spread false information and tendentious rumors” that insult Bahrain and the Gulf Cooperation Council (GCC) states” and harm their relations. 15 December 2016 - Bahrain High Criminal Court postponed, for the fifth time, Rajab's trial to 28 December. At today´s hearing he has been refused release and was not allowed to speak. 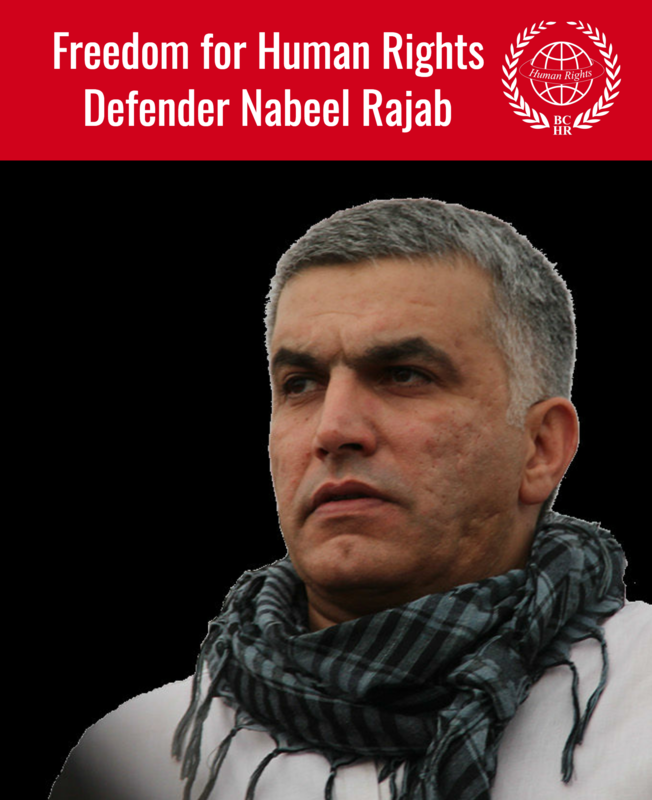 Read the Lawyer’s memorandum in the defense of Nabeel Rajab here. 7 December 2016 - See the whole timeline of Nabeel Rajab's detention and imprisonment here. From 2011-2017. 22 November 2016 - According to a Tweet posted by Adam Rajab, Nabeel Rajab was transferred for the third time to a a police hospital after suffering from chest pain. An ICG test conducted on him showed irregular heat beats. Nabeel has been in prison since his arrest on 13 June and the unhealty nature of his prison conditipns is sais to have contributed his his failing health. 16 November 2016 - Nabeel Rajab's attorney requested the court to reverse its decision to appoint an Interior Ministry employee to examine the social media account presumably used by Rajab in posting his critical tweets. The request was made due to the need to assign an independent expert to review the issue, and not a member of the accusing party in Rajab's trial. 31 October 2016 - Today, the High Criminal Court postponed the trial of Nabeel Rajab, for the fourth time. The reason for the postponement is to hire an expert from the Cyber Crime Unit to verify that the Twitter handle in question is managed by him. The reopening of his case throws a light on the lack of evidence of any wrongdoing. 24 October 2016 - Rajab's medical investigation has revealed a drop in his white blood cell, which signals a possible infection. Based on his family's statement, Rajab has never before showed such signs during the medical tests he underwent so far. BCHR suspects the unhygienic conditions in his cell are possible to blame for his deteriorated health condition. Updates on his condition will soon follow. 6 October 2016 - Nabeel Rajab's trial has been postponed today, for the 3rd time, to October 31. 3 October 2016 - Nabeel Rajab is due to undergo a surgery today to remove his gallbladder. According to an article by the Bahrain Mirror, the poor conditions in prison instigated this operation. 26 September 2016 - The detention authorities have notified Nabeel Rajab that he will be transfered to the East Riffa Police Station, where he was held during the first 3 weeks of his detention, according to his son Adam Rajab. 5 September 2016 - High Criminal Court postponed the trial of HRD Nabeel Rajab to 6 October for ruling. He has been charged with additional charges in relation to the The New York Times op-ed. 26 August 2016 - Sumaya Rajab, the wife of the human rights defender Nabeel Rajab, said that her husband was transferred to the Interior Ministry's clinic at MOI headquarters on Thursday (25 August2016) after suffering chest pains and shortness of breath. “His health situation has stabilized after conducting medical tests and he was given a nutritious intravenous drip and some painkillers, and during my visit to him to on 25 August 2016 at West Riffa police station [where he is being held], he told me that he felt chest pains and shortness of breath, and requested to visit the clinic," she told "Al-Wasat" newspaper. She added: "He underwent radiation examination, and some blood samples were taken. The results are scheduled to be received on Sunday," and she noted that "Nabeel did not previously suffer from these pains." 5 August 2016 - Nabel health condition continues to deteliorate as he remains in prison. According to a statement from his wife, the authorities have delayed urgent hospital appointment for September. 12 July 2016 - Nabeel Rajab was present in court today. His trial was postponed to August 2 despite request by his lawyers for his iimmediate release. 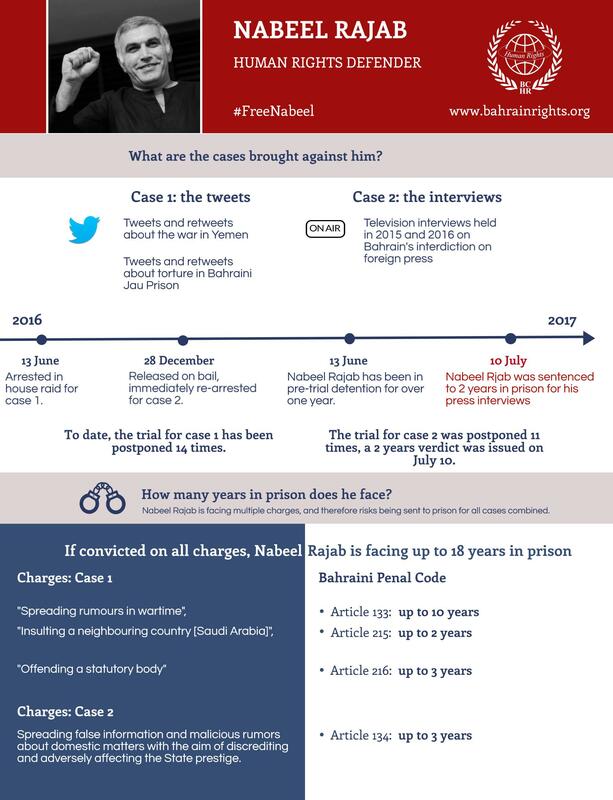 Nabeel has been in solitary confinement since 13 June. He has no contact with other prisoners and his health condition is worsening. His lawyers stated that he is harassed in detention and his right to privacy is not respected. His family who were present during the trial raise concern over his weight lost. 5 July 2016 - Nabeel Rajab continues to suffer in isolation. His hearbeat is at 52bpm, a normal one ranges between 60-100. Moreover, due to precarious detention conditions, Rajab cannot eat or drink well, or use the toilet, which is full of filth and poses a danger to his health. His overall well-being is quickly degrading. 1 July 2016 - In an article published by the Bahrain Mirror, Sumaya Rajab, wife of Nabeel Rajab raised concern over her husband's worsening health condition. She stated that his health is in continuous deterioration and that he had lost 8 Kgs in 2 weeks, as he continues to suffer from heat gallbladder and blood pressure problems. 29 June 2016 - The authorities transported Rajab back to the police station, where he is detained in solitary confinement, although his health was reportedly still unstable. 28 June 2016 - After suffering from worsening health state due to unhealthy prison conditions, Nabeel Rajab is rushed to the hospital. 26 June 2016 - The authorities transferred Rajab to the criminal court and set 12 July 2016 to be his first court hearing, over two charges both in relation to tweets and retweets posted in 2015 about the war in Yemen and also to allegations of torture in Jaw prison after a prison riot in March 2015. The charges include “posting information that could incite others and disrupt civil peace,” and “illegally defamed a statutory body.” Rajab faces imprisonment up to 13 years if convicted. 16 June 2016- BCHR has recieved information that Nabeel Rajab is enduring very poor conditions in pre-trial detention, in addition to ill-treatment. He is currently detained in solitary confinement. His cell is locked at all times, unlike other prisoners. He is not allowed contact with anyone. His cell is very dirty and unsuitable for human living. The toilet and shower are full of filth, and unhygienic. During his first visit, his family were given only 15 minutes with him. The visit was attended by a police officer, who monitored them closely. He is also being ill-treated by some police officers. He is not being treated like other prisoners and is deprived of the basic privileges. 14 June 2016- Nabeel Rajab was brought to the public prosecution after over 24 hours from arrest. He was officially charged with "spreading false news and rumours about the internal situation in a bid to discredit Bahrain". Public prosecutor issued an order to keep Nabeel in custody for 7 days pending investigation. 13 June 2016- Bahrain security forces arrested leading human rights defender Nabeel Rajab, President of the Bahrain Center for Human Rights (BCHR), Founding Director of the Gulf Centre for Human Rights (GCHR) and Deputy Secretary General of FIDH, early this morning. At approximately 5:00 AM (GMT+3) in Bahrain, police, led by the Cybercrime Unit, surrounded Rajab's home in Bani Jamra, in the north west of Bahrain. At 6:12 AM, Rajab's son Adam tweeted: "Police entered the house and arrested my father Nabeel Rajab." The authorities' reason of arrest is not yet known, and it is unknown if new charges have been brought against him. Nabeel Rajab was held at Riffa police station. He has no direct access to his lawyer. He was not informed of his charges. UN Special Rapporteur on Freedom of Opinion and Expression, David Kaye, called for the release of Nabeel Rajab, at a session held at the 35th UN Human Rights Council. Representative Jim McGovern called for the release of Nabeel Rajab in his address to the US Congress, in which he also criticized the lifted ban on arms sales to Bahrain. European Parliament resolution on executions in Kuwait and Bahrain, urges EU to intervene with Bahraini government to appeal for the release of Nabeel Rajab. United Nations Office of the High Commissioner for Human Rights - Expressed concerns on Nabeel Rajab's ongoing prosecution. US ambassador to the UN, Samantha Power, calls for the immediate release of Nabeel Rajab. US State Department states: "at today's hearing it became clear that the government lacks the evidence to support his case". Reaffirm rejection of charges and call for the release of Nabeel Rajab. US State Department rejects charges against Nabeel Rajab and call the government of Bahrain to release him. Parliamentary Under-Secretary of the UK Foreign and Commonwealth Office Mr. Tobias Ellwood replies to a written question of MP Margaret Ferrier that the UK government "will continue to monitor his case closely and raise concerns with the Government of Bahrain". Full statement here. The U.S. Department of State requests to release Nabeel Rajab. Read the minutes or watch the video. European Parliament - DROI Chair condemns the arrest of human rights defender Nabeel Rajab in Bahrain. Index - Who is Nabeel Rajab? Index - Why is Nabeel Rajab a repeated target of the Bahraini authorities? Middle East Eye: Nabeel Rajab: Held for a year on remand in Bahrain and does anybody care? English: Is Bahrain the New Breeding Ground for Political Extremism? BBC News - Sheikh Isa Qassim: What lies behind Bahrain's latest opposition crackdown?